A dear friend and long-time mentor, Stephen R. Covey, died this week. In the coming weeks, many will write about his enormous influence in the business world, in families, and on the international political stage. Rather than add to that well-deserved chorus, I’ll express my personal gratitude and remembrance. In 1984, I heard Stephen speak at a business conference. His speech opened up a whole new field to me that redirected my professional plans. Prior to that speech, I had never heard of the Organizational Behavior field. I changed the course of my studies, joined him in his fledgling company, and began a career that has enabled me to be part of work that I find immensely meaningful. In 1990, I left Stephen’s company to begin a new one and to study more carefully how to influence profound and sustainable behavior change in large human systems. While Stephen would have preferred that I stay with his company, he was abundantly generous in wishing me well—and even went out of his way to endorse our work on many occasions. I have no doubt that his foreword to Crucial Conversations was an important part of its success. 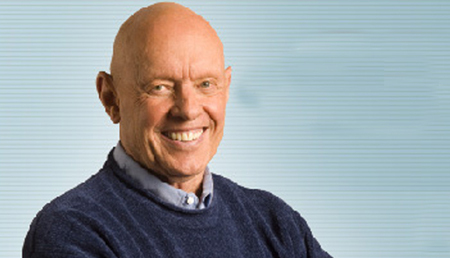 Stephen R. Covey has had as great an influence on who I am and what I do as anyone else in the world. His consecrated life, his principle-centered approach to our field, and his fundamental faith that true principles will bear up to scientific scrutiny in organizational success have blessed my life and my work. I thank God for bringing this good man into my life. Joseph, I hadn’t realised you worked for Stephen R Covey, but that makes sense. Crucial Conversations and 7 habits are both required reading for my Coaching clients and at every seminar and workshop I run they are on display and referenced. Now joined by Change Anything. I purchased The 7 Habits soon after publication on a trip to Boston (I live in the UK). It changed my paradigm and caused me to change the lives of others as a result. It took me quite a few years to exit the world of IT and enter coaching – a step that felt like coming home to where I belong. I know that this was triggered by the teachings of Stephen R Covey. The 7 Habits of highly Effective People is my guidebook for life. I was fortunate enough to be in the audience for one of Stephen’s workshops in London many years ago and I remember it vividly to this day. Thank you Stephen. It was quite a shock to hear of Stephen’s passing. So sorry for your loss; I do remember hearing that you started with the Covey organization. Remember to take care of yourself at this difficult time. Joseph, thank you for articulating so well what so many of us feel. In the myriad well-deserved eulogies that will commemorate Stephen’s life, it will be hard to overstate his immense impact on so many of us directly, and on those we influence by extension. Dr. Covey’s work has affected me deeply–to my professional and personal DNA–and, like you, has made it possible for me to build upon a solid foundation to rise to even greater heights. Not at all to distract from Stephen’s well-deserved praise, but you and your colleagues are likewise making the world a better place with your work. There are many of us who do and will thank you for contributing to make our lives measurably more vital. Your work is a fitting tribute to Stephen and other giants like him whose work enriches professional and personal lives. Feel sorry to learn the sad demise of S. R Covey, a loss will hardly be filled up ever. I was immensely impressed with his thought on TRUST a vital resource for an organization to progress. May ALLAH keep the departed soul in peace and help the family to bear the loss.